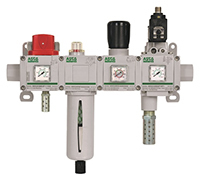 Asco Numatics is a leading manufacturer of pneumatics and motion control products. 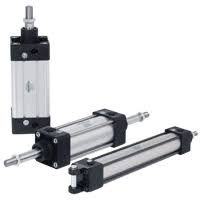 Their broad spectrum of custom developed products and application components have made a significant impact on pneumatic innovation as well as pneumatic and motion control technology. Numatics directional control line of valves are available in a wide range of port sizes and Cv flow capacity. The 500 and 2000 series valves offer advanced circuit board technology inside. All are Fieldbus Electronics capable. Numatics ISO valves adhere to the specific mounting footprint established by the International Standards Organization (ISO). Numatics Fieldbus Electroincs' Innovative Graphic Display is used for easy commissioning, visual status & diagnostics. Modular reality, no internal wiring for valve solenoids, discrete I/O status with short circuit protection, software or manual configuration. Protocols: DeviceNet, Ethernet, PROFIBUS-DP, CANopen, PROFINET, DeviceNet w/DeviceLogix, DeviceLogix, DeviceNet, Allen Bradley 1771 Remote I/O, AS-i, CANopen, ControlNet. ​Numatics compressed air treatment products include filters, regulators, lubricators, emergency shut-off / soft-start valves, and accessories. This line of high-flow, modular, and in-line products include sizes from 1/8" to 1" and offer the performance and flexibility to meet today's demanding applications. Aluminum NFPA Interchangeable cylinders that are designed and built to excel in the most demanding applications. Non-repairable stainless steel body air cylinders that are the perfect solution for tight design budgets. Designed to fit tight space requirements, the low profile design and variety of mounting options make these cylinders extremely popular. A variety of rodless cylinders including guided and non-guided versions. Extruded aluminum barrel or magnetically coupled stainless. Angular gripper utilizes a double acting piston with a dual pivot system. The NRG series gripper offers both synchronized and compliant (non-synchronized) movement. Numaitcs offers 2, 3 and even 6 finger grippers. 6 finger gripper design utilizes a dual acting piston to open and close gripper jaws. All six jaws are synchronized for accurate positioning. 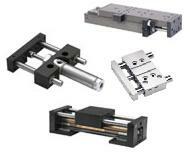 Numatics wide range of Slides and Gantry products provides guided linear motion. From the cost effective LCX series to the Rodless Gantry Series these products provide sizes forces and precision needed for your linear motion applications. Numatics heavy-duty rack and pinion style rotary actuator is designed to excel in the most rigid applications. The LR series rotary actuator is a low profile rack and pinion design. The RM Series rotary manifold utilizes a unique concept in transferring air pressure thru fixed ports to rotating parts on the rotary platform. The torque rack on the AR Series produces the rotary output torque while the control rack determines rotary stroke. Clayton Controls is an Asco Numatics distributor in California. We offer technical support to help our customers solve their applications.